The Piggy Riches slot machines is an enjoyable fifteen winline slot from Net Entertainment. Using highly detailed images and smooth, feature rich gameplay; Piggy Riches is an enjoyable slot game made more-so in its conversion to mobile with a less cluttered user interface and easier to use controls. The Touch version of Piggy Riches has been altered from the desktop/laptop version to run perfectly on Windows, Android and Apple mobile and tablet devices whilst still retaining everything that made its larger cousin popular. With an RTP of 96.4% and stakes from 1p up to £75, the Piggy Riches slot machine caters for all budgets whilst still maintaining a high return game whatever your chosen playing stake. 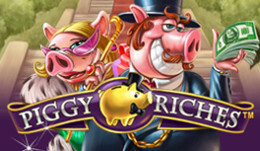 Playing Piggy Riches is very straightforward, and anyone who enjoys Net Ent slots won’t be surprised to find highly detailed slot symbols and imagery to bring a sense of realism to the game, although my opinion is Piggy Riches is slightly more cluttered than other net Ent slots in terms of imagery, depending on your device you may enjoy it more. Piggy Riches has a free spins feature whereby landing three or more symbols anywhere in view opens up the bonus game. This then gives the player a choice of various amounts of free spins and multiplier options, so choose what’s right for you then enjoy the bonus. During the game each additional scatter in view awards one extra free spin up to a maximum of 28 with a X6 multiplier. Although the free spins bonus is what everyone wants, the standard game also has profitable reels with winning combinations helped along by wild symbols available on all of the five reels. Any wins completed with a wild awards a X3 multiplier, so the winning potential away from the bonus game can be very large. You can play Piggy Riches at your favourite Net Ent casino with many offering a free play option to get used to the game.